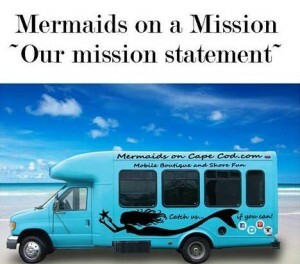 The Mermaids on Cape Cod bus will attend our Pre-Party on Friday, May 6 (5 to 8 pm)! Mermaids on Cape Cod is a mobile boutique that embraces artists on Cape Cod and shopping local. We all need to work together to keep Cape Cod thriving. Mermaids on Cape Cod looks for local artists, jewelers, authors, soap and candle makers along with other “made on Cape Cod” delights. In supporting local artists, we share the value of working together. The Mermaids partner with businesses, coffee houses, ice cream shops and restaurants sharing the marketing and advertising of each place we visit. They offer us a spot to be for the day, and we advertise with them on social media (between our sites, we have almost 4,000 followers), e-blasts, newspaper print media, radio when possible, and BNI type networking. The Mermaids offer the owners and staff of each location a percentage discount (or a fundraising check) as sincere thanks for hosting us. We are a very new shopping concept and hope to make new friends with business along the Cape by helping promote and instill a sense of value in shopping and supporting local artists while working together to grow our community.